It’s the end of Coffeeneuring as we know it for 2013! Ok, if I can’t make the ride special, let me make the bike special. 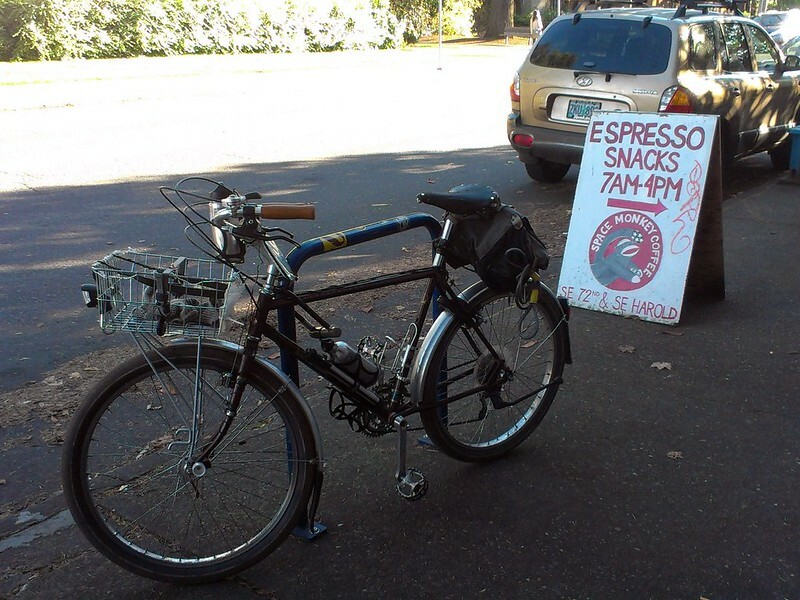 I had used three out of my four “daily” bikes for the previous six coffeeneuring adventures. The one I hadn’t pulled out yet was the Bridgestone XO-3, basically since I haven’t been riding it since “winter” has started. I wanted to install fenders but the Resist Nomad 700X45C tires were too big for that. So I picked up some smaller tires and spent the better part of a day attempting to install them. “Attempting to” is the key words there. 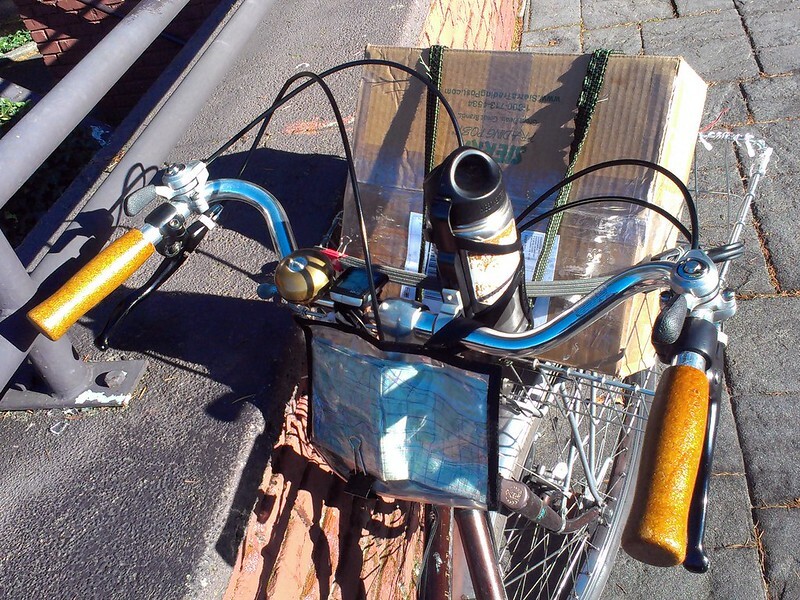 I realized that the fenders are a bit too small to work, so I should get bigger ones. Normally I’d just run to the bike shop and get them, but as I’m very, very broke right now, I have to wait until the next paycheck. So scrap that. So I took “old faithful”, the Raleigh Crested Butte, instead. Yes, I ride the Crested Butte a hell of a lot, more than any other bike I own right now. But I actually hadn’t ridden a bike in two days,* so when I took it out on Thursday November 21st it felt fresh. Hey, I really like riding this bike, I thought to myself. 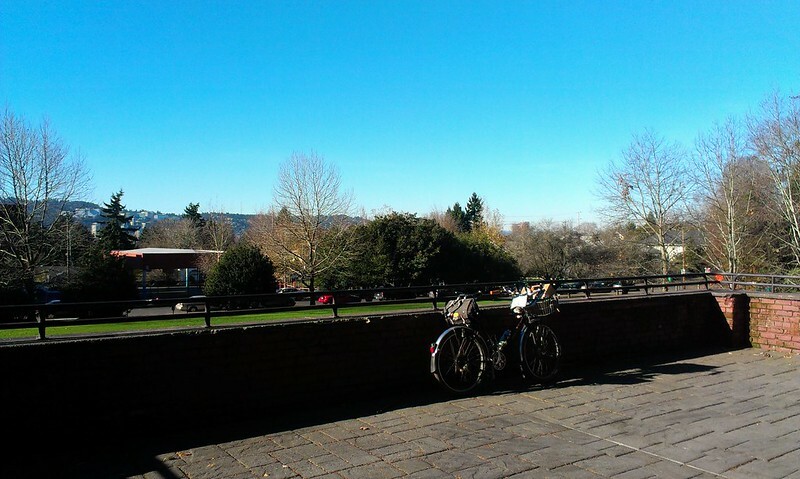 And what a beautiful day for a ride: sunny, clear, crisp. I think one thing that aided my enjoyment was new grips. For the past year I had some PDW “Dapper Dan” leather grips on this bike. They looked stylish but they weren’t that ergonomic. And over the past few months, the leather had deteriorated quite a bit. So I took them off and put on a pair of shellacked cork grips, the old standby. Inexpensive ($10-15 for a set), and when they wear down, you shellac ‘em more. When they totally wear out, you get some new ones. Not only do the new grips look nice, but they are a lot more comfortable. 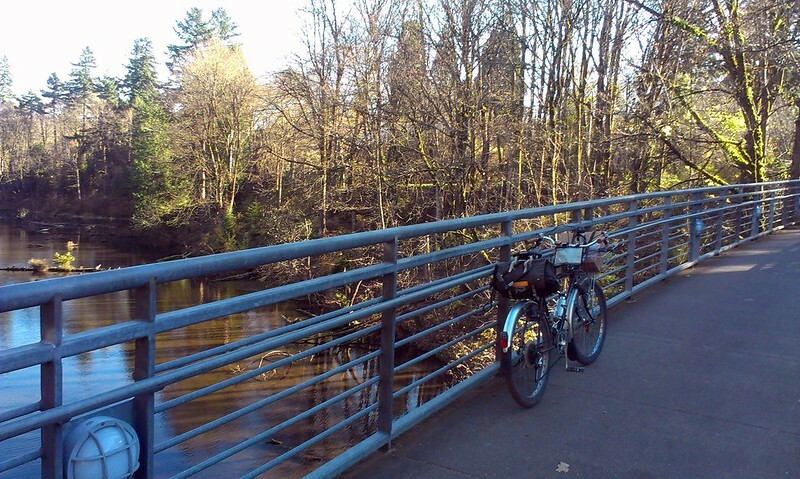 Anyways I took a meandering route through SE, passing over Crystal Springs Creek in the Reed College campus, then used my “rough stuff” routes through the Woodstock neighborhood. The coffee destination: Space Monkey Coffee on SE 72nd at Harold in the Arleta neighborhood, just across from Mount Scott Park. I don’t go to Space Monkey that often, as I don’t find myself in “this neck of the woods” often. Space Monkey is the type of “funky” unpretentious coffee shop that populated Portland when I first moved to town in 2001. This was before the Stumptownization of coffee in Portland (and to an extent, the world) took over the world. Yes, the coffee is better now, I will agree, but many modern coffee shops are pretty sterile. For instance Space Monkey has couches, which is verboten in the Stumptown manual. (I think they aren’t even allowed to sell you beans if they see a couch in your café. **) And Space Monkey has a community message board along with an ancient internet terminal, so 1999! Don’t think I’m ragging on Space Monkey, they are a good place (why would I go there if they weren’t?) and have good coffee roasted by Cellar Door. I ordered my standard: drip coffee. And added soy milk and sugar. The last coffeenuring ride: not as special as I had intended it to be, but still special. Total route 5.8 miles. Html widget no worky, so go here to see the route map. *When you live seven blocks from work, you can walk if you want to. **And people were having honest-to-goodness conversations on those couches when I was in there!